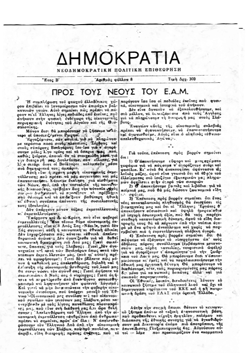 A copy of a leaflet entitled Dēmokratia: Neodēmokratikê Politikê Epitheôrēsē (Democracy: Neodemocratic Political Review), Year B', no. 8, Price: 300 drachmas, presented as a publication of EDES. 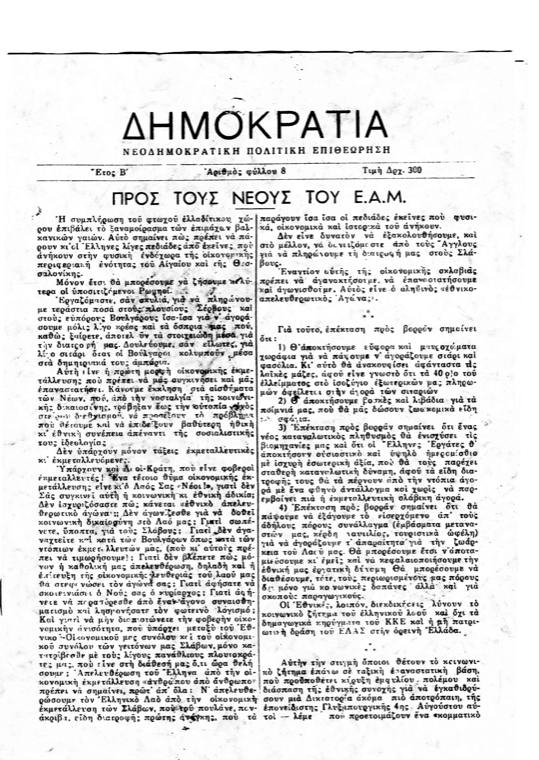 The lead article is entitled “To the Youth of EAM,” and it rehearses the already well-known argument that EAM and the Communist Party of Greece were willing to allow Bulgaria to claim Macedonia. 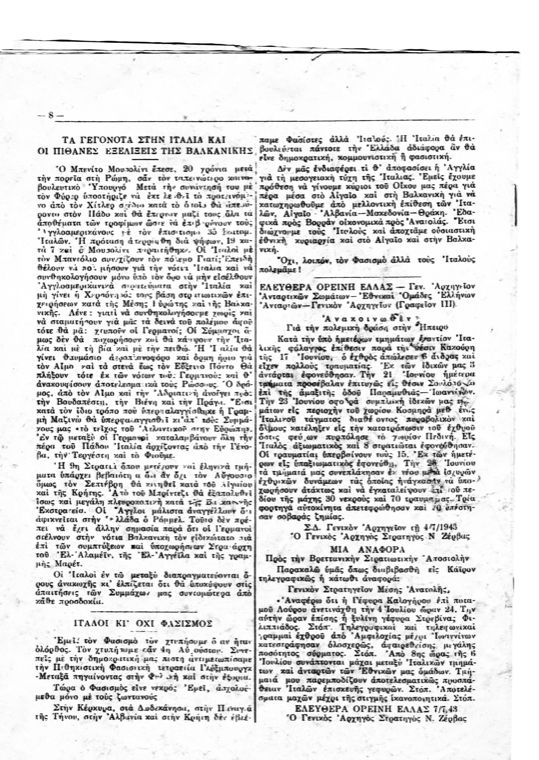 From a different angle, however, the article tries to convince the youth of EAM that, if Bulgaria does not annex Macedonia but instead Greece expands northward and annexes the Slavic countries, then Greece will solve its economic problems. The back page has a short analysis of events in Italy, speculating that Italy would surrender (as it did, in September 1943). It states that EDES was fighting not fascism but Italy, because Italy would always covet Greece. 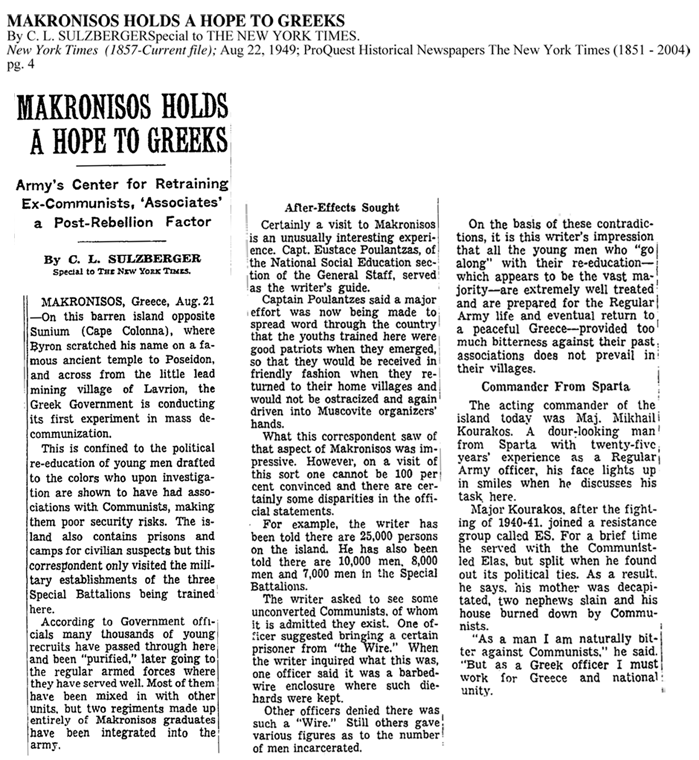 There are two dates on the back page, one on an announcement about the military action in Epirus of July 4, 1943, and the other on a report to the British Military Command in the Middle East about the blowing up of a bridge on the river Louros, dated July 7, 1943. I have no means of evaluating this document, because of the circumstances that surround its acquisition. One evening, in the winter of 2005, I was walking south on Amsterdam Avenue in New York City crossing at 110th Street. In the middle of the intersection, a large piece of paper caught the corner of my eye. Thinking that it might possibly be valuable to someone who had lost it, I picked it up, with the intention of trying to find its owner. What I found instead was this four-page leaflet. 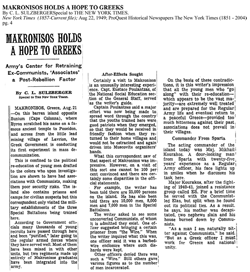 “Makrónisos Holds a Hope for Greeks”: article published by Cyrus Leo Sulzberger in The New York Times, August 21, 1949, p. 4, a week before the collapse of the DSE at Vitsi. 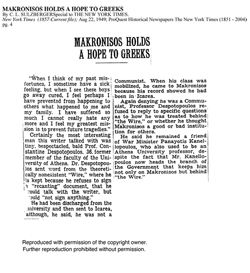 The article was written after Sulzberger, accompanied by his Greek wife, Marina Tatiana Lada, who acted as translator, visited Makrónisos. 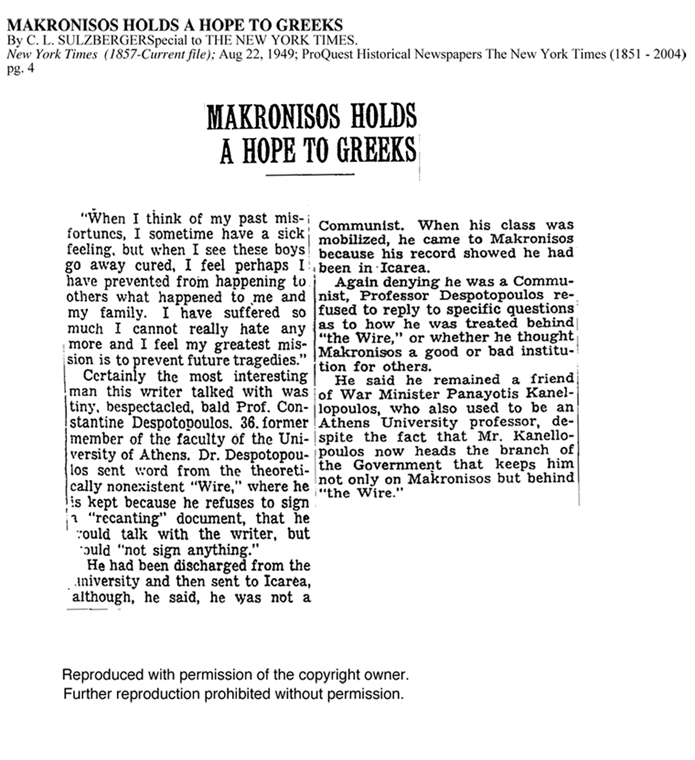 Sulzberger asked to speak with some of the incorrigibles on the island, and Konstantinos Despotopoulos was brought out from “the Wire” to speak with him. 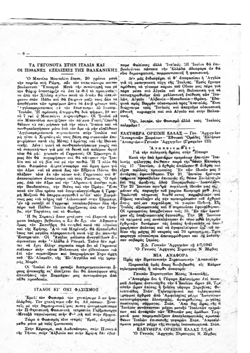 Despotopoulos has noted that when he entered the office of the director of the camp, he saw “not only the Director, but also an American journalist and a lady [acting] as interpreter. He posed various questions. 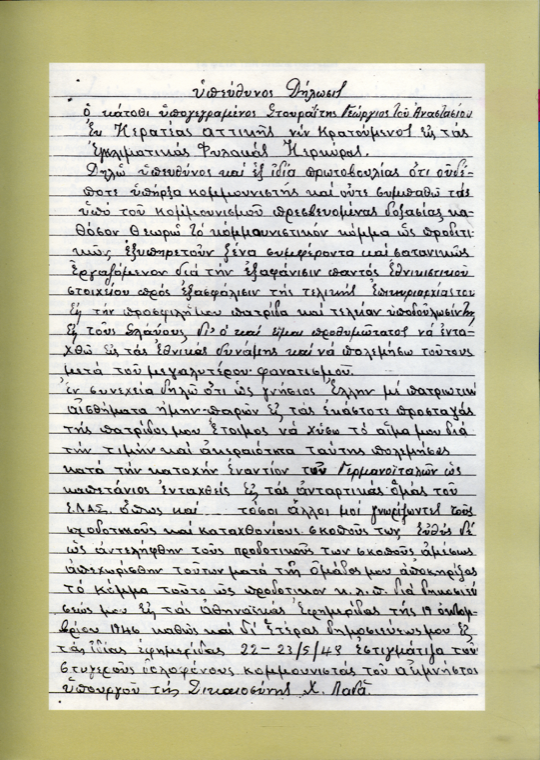 I dared both to go beyond the questions and to develop my more general thoughts about what was then happening in the rest of Greece and in the world, as much as the circumstances and the presence of the director there allowed me, and even beyond. When the interview was over, the foreign journalist addressed me with very sympathetic words and announced his name. He was the famous journalist of the Times of New York, Sulzberger. And the until-then interpreter introduced herself to me in a familiar tone: 'Mrs. Sulzberger, that means Marina Lada, Soteriadou's cousin, friend of Mrs. Ioanna Tsatsou, and your friend' ” Despotopoulos 2006a: 35). 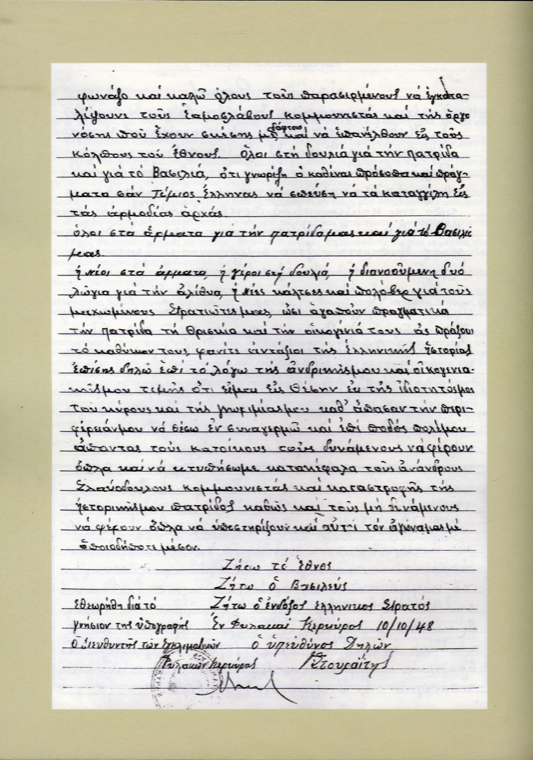 Mrs. Ioanna Tsatsou was the sister of the poet (and later Nobel Prize Laureate) George Seferis and wife of the philosopher Constantine Tsatsos, who was, of course, a friend of Despotopoulos, and whose chair at the Faculty of Philosophy Despotopoulos had filled. 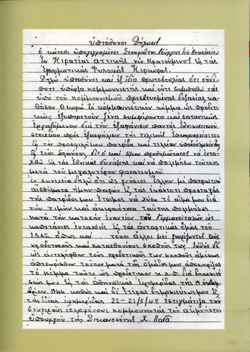 A declaration of repentance, found in the archives of the Municipality of Markopoulo. 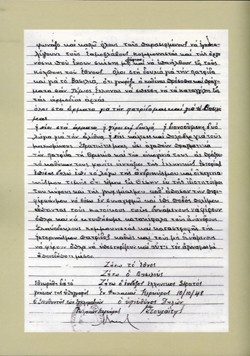 It is signed by Georgios Stouraitis from Keratea (a town southeast of Markopoulo, on the Attican peninsula), who had been imprisoned on Corfu. I am grateful to Stamates Methenites, the local historian in Markopoulo, who drew my attention to it. Reproduced with permission. 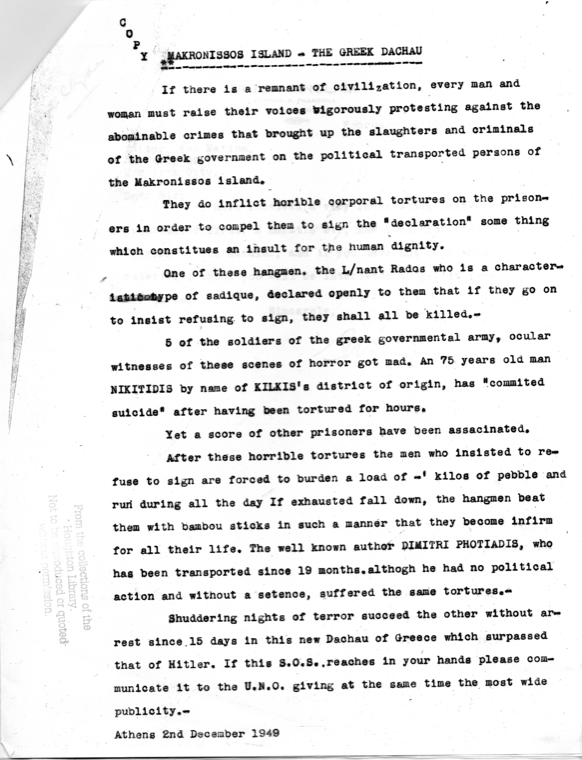 An anonymous letter that made its way out of Makrónisos, entitled “Makronissos Island—the Greek Dachau.” The letter found its way to Upton Sinclair, who passed it on to The Nation, with a note placing the magazine at liberty to use the letter if it wished. The Nation did not publish it. 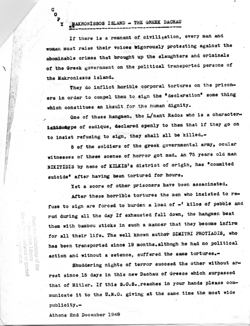 Found in The Nation archives at the Houghton Library, Harvard University. Reproduced with permission.